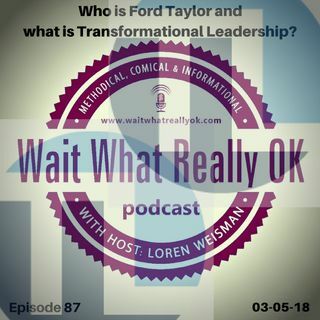 Wait What Really OK Podcast Episode 87 hosted by Branding Strategist and Keynote Speaker Loren Weisman talks with Ford Taylor, the founder of Transformational Leadership. In this interview with Ford Taylor, I talk about his past, his present and his approach to leadership and how he stands out from the array of other leadership trainings and programs that focus more on motivation over the implementation and practical ... Más informaciones tools to apply. Ford is known as a man who can solve complex business issues, with straightforward practical solutions, while maintaining his focus on the people that serve the organization. After completing a Business Management degree from Texas A&M University, he jumped into becoming an owner/operator of small apparel company named CC Creations. Ford Taylor’s Transformational Leadership maintains a visions to develop transformational leaders within every organization. They grow high performing teams through teaching, training, and equipping, while empowering high performing individuals with healthy relationships. Episode 87 of the brand strategy podcast Wait What Really OK is called Who is Ford Taylor and what is Transformational Leadership or TL? The show is available on iHeartRadio.